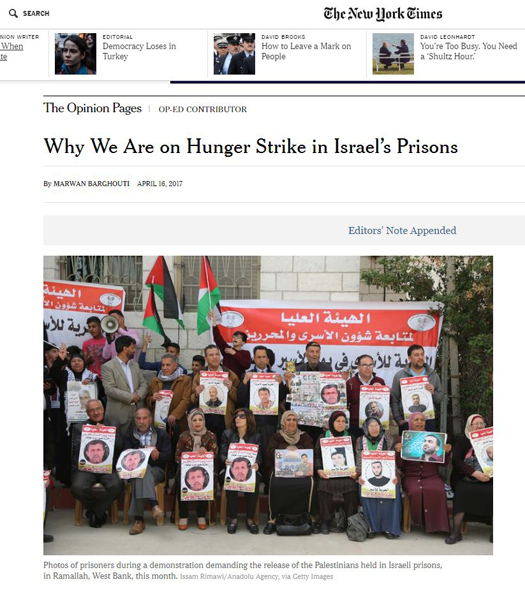 Yesterday, as Jews were celebrating the end of Passover, The New York Times created a public uproar by publishing an Op-Ed by convicted terrorist Marwan Barghouti (“From prison, a Palestinian seeks justice“), and failing to notify readers that he was convicted in an Israeli civilian court of five counts of murder and one attempted murder, and was implicated in four other terror attacks. 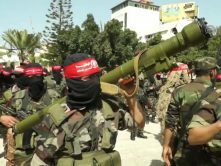 Senior Israeli politicians including Yair Lapid and Michael Oren slammed The Times for identifying the jailed Fatah terrorist only as a “Palestinian leader and parliamentarian,” as did former U.S. Ambassador to Israel Dan Shapiro. In addition, Stephen A. Silver, CAMERA 2002 Letter Writer of the Year, corresponded with Matt Seaton, the New York Times staff editor responsible for Barghouti’s piece. Before The Times added the additional information concerning Barghouti’s convictions for murder, Seaton defended his decision not to include this critical material. 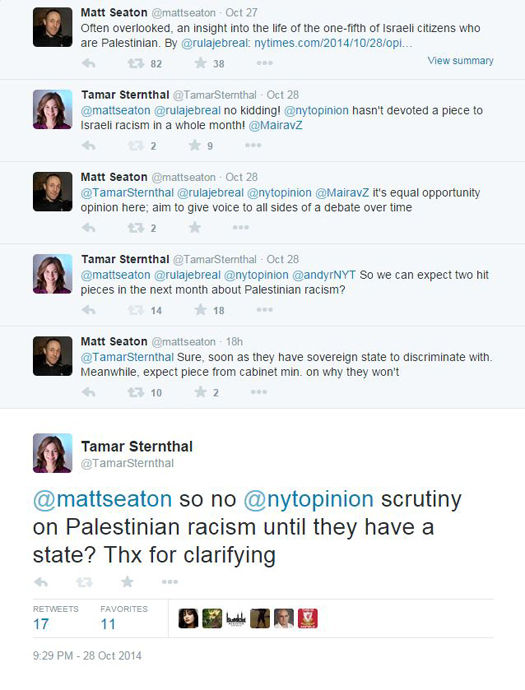 It should be noted that Seaton is the very same editor who admitted in a November 2014 Twitter exchange with CAMERA’s Tamar Sternthal that The Times’ Op-Ed holds Palestinians to a lower standard. neglects to add that he is a member of Fatah’s murderous Tanzim militia; that he founded Fatah’s Al-Aqsa Martyrs Brigade terrorist wing that carried out more than one-quarter of the suicide bombings during the Second Intifada and has been branded a terrorist organization by the United States, Canada and the European Union; and that he was convicted of murdering five Israelis in terrorist attacks that he personally organized and directed, including a car bombing in Jerusalem and a massacre at a seafood market in Tel Aviv. 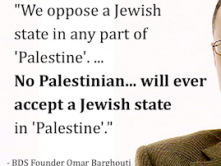 Mr. Barghouti is a well-known public figure, whose status as a Palestinian leader, as well as the reasons for his being imprisoned, are widely known and reported; therefore the kind of commentary in his biographical description that you are calling for was unnecessary. Further, the author disputes many aspects of his trial and the Israeli judicial process; in that circumstance, we prefer to opt for a neutral description, not to impose what would, in effect, be an editorializing gloss on the author, against his wishes. I am far from convinced that he is as well-known to your readers as you believe, or that the fact that the reason why he is in prison — because he was convicted of killing five people — is as well-known as you suggest. 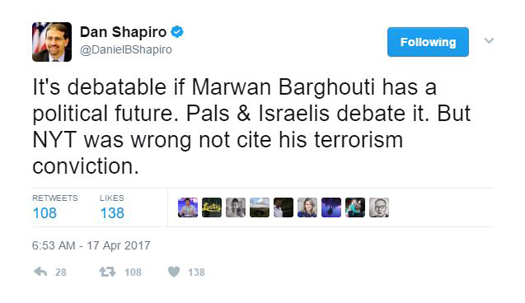 And while Mr. Barghouti has repeatedly condemned the Israeli judicial system, I’m not sure he has ever disputed the specific allegations that were the basis for his conviction. 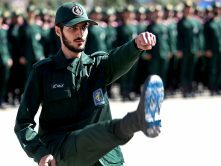 Moreover, his role as founder of the Al-Aqsa Martyrs Brigade, a designated terrorist organization by the United States, Canada and the European Union, is likewise not disputed. Finally, the fact that he was convicted of killing five people, whether he acknowledges or disputes the underlying allegations, is indisputable. I understand and respect your position. I do, however, believe your readers are entitled to facts that were not included in the tail. 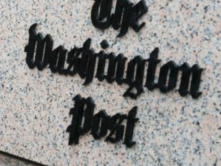 In addition, editors added a note prominently to the top of the digital Op-Ed directing readers to the Editor’s Note at the bottom of the piece. The piece also ran in the International New York Times’ print edition yesterday, and CAMERA calls on The Times to run a print correction there as well. 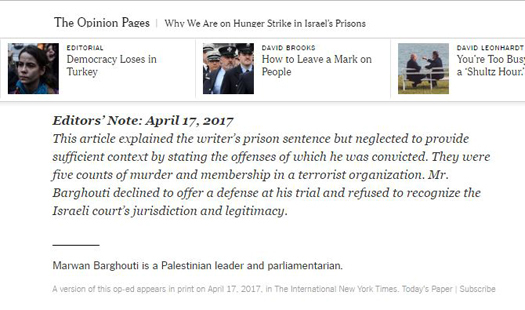 According to Haaretz, the younger Barghouti “was convicted of weapons possession and freed after serving a 34-month term behind bars.” Times editors allowed Barghouti to withhold this information from readers. In short, the Barghouti Op-Ed fiasco underscores that while The Times says it holds governments accountable, it exempts Palestinians, as Seaton previously acknowledged. 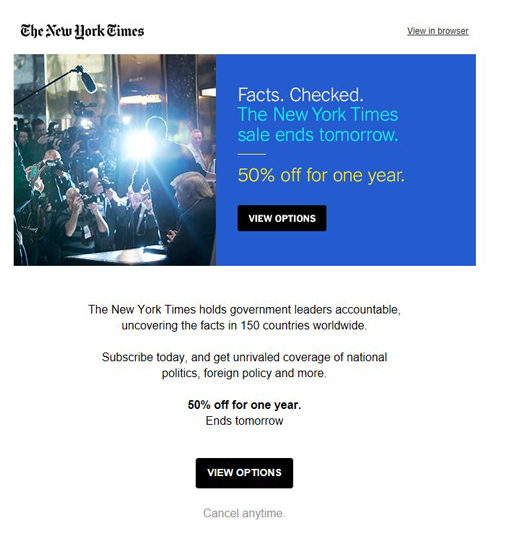 And while it claims to check and uncover facts, readers should remember that The New York Times gives a pass to “the facts” offered up by convicted terrorists. This isn’t a new issue for the Opinion section. I have written before on the need to more fully identify the biography and credentials of authors, especially details that help people make judgments about the opinions they’re reading. 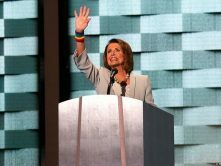 Do the authors of the pieces have any conflicts of interest that could challenge their credibility? Are they who they say they are, and can editors vouch for their fidelity? I see no reason to skimp on this, while failing to do so risks the credibility of the author and the Op-Ed pages.